As IoT proliferates, the amount of data passing through these centres each day from devices communicating with cloud platforms is simultaneously rising. Today, much of the data emitted from devices connected to the Internet of Things (IoT) flows through the largest and most advanced global cloud and data centres worldwide. As IoT proliferates, the amount of data passing through these centres each day from devices communicating with cloud platforms is simultaneously rising. Research conducted in 2015, arguably before the worldwide surge of IoT devices being introduced to the network, suggested that in the United States alone, data centre energy consumption will increase to roughly 140 billion kilowatt-hours annually by 2020, the equivalent to nearly 100 million metric tons of carbon pollution. The machines processing such large caches of data are now having to work even harder, requiring an ever-increasing dependency on physical infrastructure, and therefore, energy. This is a knock-on effect of IoT ‘things’ inevitably using more energy to communicate with cloud platforms, especially in power-dependent applications and for remote devices in the automotive, logistics and transport sectors, to name a few. Concerns are now being raised over the impact the increasing energy consumption of IoT devices is having on the environment, in light of the ongoing global push for energy efficiency. The rate of IoT uptake is forecast to soar over the next few years, as many companies look to utilise this ubiquitous network to both collect and communicate data from anywhere in the world. The number of connected ‘things’ in use worldwide is predicted to reach 20.8 billion by 2020, a figure which surpasses today's 3.77 billion internet users by more than fivefold. Putting this consumption of energy into perspective, one Google search is now estimated to generate the equivalent of approximately 0.2 grams of carbon emissions. However, with many more ‘things’ than humans now leveraging internet connectivity to continuously transfer and communicate information, it is crucial that companies understand just how much energy is being used and paid for unnecessarily and how they can lower the environmental repercussions of this rising IoT activity. To ensure efficient IoT, it is important that device owners are making intelligent decisions when deciding what data needs to be communicated via IoT, by adopting a more proactive approach to the way it is managed and where it is processed. By only pushing data to and from an enabled application when necessary, owners can reduce the amount of data which needs to be sent and processed. It would be more efficient to set certain parameters for when data should be sent to cloud-based systems, rather than regularly sending pre-scheduled updates, irrespective of whether there is any value in collecting this information. For example, a sensor that monitors water levels should not be required to tell the cloud platform that it hasn’t risen or lowered at regular intervals throughout the day; it should only send data and consume energy when the level has risen or fallen by a certain amount. By doing so, the rate and scale of data being sent to the cloud and processed will be reduced, resulting in a reduced carbon footprint. Not only does this have a positive impact on energy consumption, but also helps enterprises to improve efficiencies and drive down costs as data storage and analysis requirements are reduced. If enterprises make increasingly intelligent decisions about when and under what conditions to collect data, this will have a significant impact on energy consumption and overall efficiency. On the other hand, once such control is deployed, the ability to alter the logic of collecting data at any time, without recalling devices to be manually overridden, is equally essential to enabling successful IoT. To reduce the rate of energy consumed by IoT, it is crucial that we now embrace emerging solutions, which are promising more successful and energy efficient IoT connectivity. 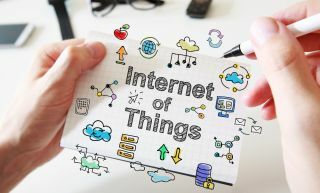 By utilising alternative technologies, which require less power and offer a smarter way for connected devices to talk to each other, IoT users can somewhat slow the environmental strain caused by mass data processing, worldwide. Companies across the IoT space are now investing heavily in creating solutions which both save energy and reduce costs. Now, one viable solution would be to opt for a low-power, wide-area network (LPWAN) option which removes internet connectivity from the data-transfer process. One way to achieve this is by using low-bandwidth, core GSM messaging which doesn’t use cellular data or SMS capabilities. This enables small quantities of data to be sent both to and from devices using minimal power, from almost anywhere in the world. Instead of using a TCP/IP protocol, this form of messaging doesn’t utilise a physical internet connection. It is this ubiquity which makes it an ideal solution for enabling sensors to interact efficiently and with full connectivity at lower cost. This basic form of connectivity can therefore reduce dependency on the current internet and data processing infrastructure, lowering the amount of power needed to transfer data between devices and permitting a more reliable, sustainable, energy efficient network in which to share information. This also guarantees the security of the data being transmitted, as the devices are not exposed to the modern-day vulnerabilities of the network, thanks to the lack of an IP address to send data to the corresponding IoT platform, offering greater stability. This solution is particularly suited to lower-power transmitting devices, such as smart sensors, which require just one small component to generate tiny amounts of data, using as little energy as possible. Coupled with such applications, Unstructured Supplementary Service Data (USSD) is an example of such technology that can be easily implemented at scale across all industries, building the foundations for environmentally-friendly global IoT connectivity. Amidst the growing concerns over energy efficient IoT, users should now evaluate whether all of the data being released from these devices and consumed by data centres is really necessary, or whether they could instead adopt a more selective approach to the type of information which is gathered and processed. As we enter the next phase of IoT evolution, businesses are now able to utilise the entire spectrum to improve the efficiency of their data processing and reduce the need for high-power resources. The emergence of fog computing is enabling companies to extend cloud computing to the edge of a network, to store data without relying on cloud-based centres and facilitate communication outside of the internet’s infrastructure. By sitting closely to the edge, which today in many cases would be a physical object such as a sensor, owners are able to gather more selective yet valuable data nearer to its source, reducing the data capacity needed for information to travel before it is processed. This improved decision-making can now be widely leveraged to ensure the most relevant intelligence is communicated to data centres, resulting in less unnecessary, energy-consuming data and more available resources for big data IoT. With the growth of IoT technology showing no signs of slowing, it is becoming ever-more important that those operating within its increasingly connected network adapt their approaches to processing data and implement new strategies, which promise lower power usage and greater efficiency. Doing so at this relatively early stage of the IoT lifecycle will undoubtedly lay the foundations for improved environmental sustainability in the industry.